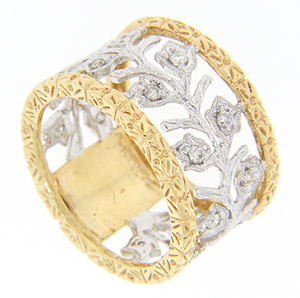 This wide 14K gold antique style wedding band is crafted of white and yellow gold. 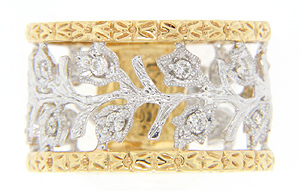 The central floral/vine design is done in white gold and is studded with diamonds. There are approximately .30 carats total weight of diamonds in the ring. The ring measures 1/2" wide. Size: 7 1/2. We can re-size.